For the past two years, my older boys, Sam and Ari, and I have gone on an amazing volunteer vacation together. We worked with Youth Rebuilding New Orleans to rebuild homes that were destroyed in Hurricane Katrina. The homes are then re-sold to teachers at affordable rates to encourage educators to come back and continue revitalizing this amazing city. Here is the story of how we decided on a volunteer vacation and why we chose Youth Rebuilding New Orleans. Sam and Ari are twins. Ari is our humanitarian. When he and Sam were five years old, someone asked them what they wanted to be when they grew up. Sam declared he wanted to be a professional basketball player because they make the most money. Ari said he was going to be an artist -- and give away his work for free on the street. He is still that same kid. He carries granola bars in his backpack for every homeless person we pass on the street. He is also the only one in the house who feeds the beta fish for fear of being responsible for the loss of a life. When I suggested a volunteer vacation he did not let it rest until I found and booked a trip. Sam is a project, goal oriented kid. He loves learning new skills and he is a perfectionist when it comes to art and building. He has also been asking if he could get a job since he was 7. The idea of “working” for an organization to build homes was high on his list of very cool things to do. After doing a bit of research (lots of googling “volunteer vacations with kids”) I found that most volunteer/travel organizations had an age requirement – usually around 16. Sam and Ari were 11 at the time, and our youngest, Dov, was 5 ½. Craig, my husband, graciously offered to keep Dov busy if I could find a trip that Sam and Ari could go on. So I started dialing. When I called Youth Rebuilding New Orleans, William Stoudt answered the phone. He told me that he grew up in New Orleans and was evacuated on the last plane out during Hurricane Katrina. When he came back home he found his city destroyed. He wanted to help in the relief efforts to rebuild New Orleans but was turned away from most organizations because he was told he was too young to help. So William, along with his friends, and his twin brother (twin brothers…I was hooked), founded YRNO to allow youth to contribute to rebuilding their city. YRNO now depends on students to help do the organization’s work. They accept kids 10 years old and up (as long as they volunteer with an adult). We were in. William also told me that YRNO is very popular with college students. What college kid doesn’t want to come to New Orleans, do some good and then party their face off on Bourbon Street? He wisely advised me to avoid traditional vacation times because the job sites would be filled with older kids and Sam and Ari may not get to do the heavy lifting. I decided to pull them out of school for 2 days so that we could volunteer on a Thursday, Friday and Saturday. It was the best decision. Sam, Ari & I worked alone on the job site with the YRNO staff. On our first day, William introduced us to the YRNO team -- John Coyle and Danielle Holmes, Prince Holmes (who took over for William as Executive Director this year) and Maggie Daly. They all made us feel like family from the moment we arrived. We got right to work. Day one, we painted the exterior of the house, planted trees in the front and filled in ditches in the road. After we were done with work on the first day, William took me, Sam and Ari on a tour to give us some context of New Orleans, pre and post Katrina. We learned about the storm, the people and neighborhoods it affected, the rebuilding efforts and the current situation 12 years later. On day two of work we met Miss Nancy (everyone is Miss or Mr. down south). Miss Nancy lived on the block of the house we were working on. The YRNO team is committed to helping all neighborhood residents better their homes and they had gotten to know Miss Nancy during their time on the block. Miss Nancy’s dog was taken away from her because she did not have a proper place for him to live. We spent the next two days building the “sickest dog house” you have ever seen (Sam’s words…). Miss Nancy worked with us, she took us in to her home, spoiled the boys with ice cream, draped them in Mardi Gras beads and after Sam told her that his class was learning about Hurricane Katrina in social studies, she literally took a photo and poem collage she made after the storm off her wall for him to bring back to his class. YRNO cares so deeply about NOLA. They make friends with everyone around their work sites. They clean up streets, help neighbors and share materials with other construction workers on the block. They also get to know their volunteers. On both of our trips Danielle and John were with us constantly – they supervised us, they came to lunch with us, John proudly showed us his new home that he is renovating and during our second trip Danielle even pulled her son, Tyrone, out of school on his 11th birthday to work on the site with Sam and Ari. I say this to illustrate how special this team, and this experience, is for your whole family. 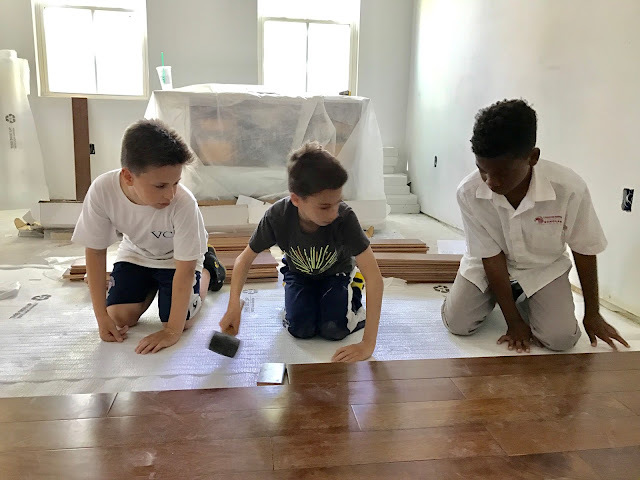 Not only is it hands on work -- Sam and Ari were trained to use multiple power tools, we painted, caulked, lifted, cleaned and built -- but they also felt the pride of having been responsible for painting someone’s house, planting their trees, laying the wood floor in a master bedroom and helping to get a dog returned to its owner. YRNO allowed us to work directly with the people we were there to support and get to know the history and culture of New Orleans through the people that have lived there their whole lives. We went there to serve the New Orleans community but we were transformed in the process. We got more out of the experience than we even could have given. I cannot end this blog without a brief mention of the “vacation” part of our trip. One of the reasons we loved YRNO so much is that after work we got to play in the amazing city of New Orleans. 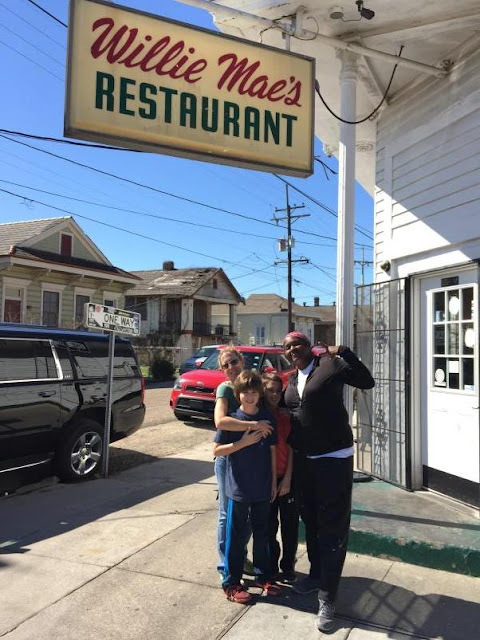 We ate our weight in beignets on a daily basis, heard some of the best live music in French Quarter, talked to artists and poets and soaked up as much of NOLA as we possibly could before we headed home. 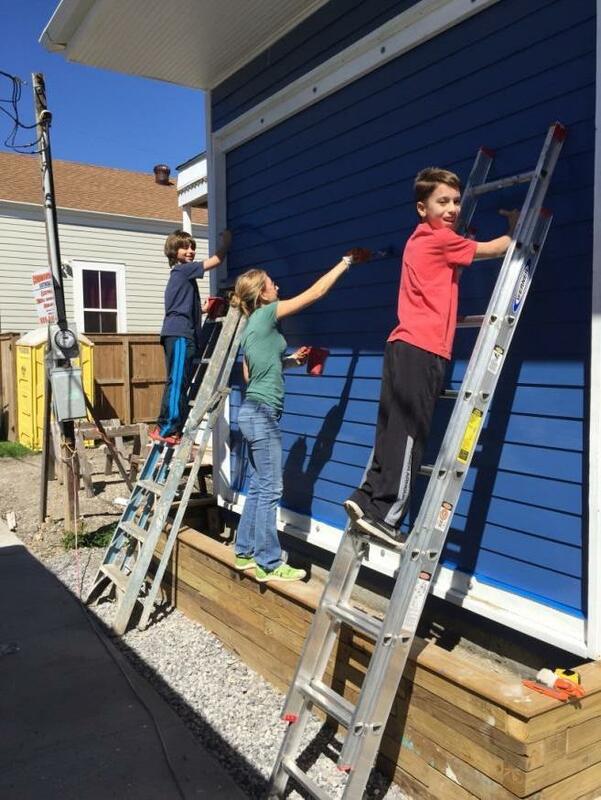 If a trip to New Orleans seems too much - you don't have to be on site to make a difference. Youth Rebuilding New Orleans relies on private donations to supplement the income from selling the homes to run their organization and continue giving back to the people of New Orleans.